For the past few months, I’ve been participating in the Bread Baker’s Apprentice Challenge, an online challenge that has bloggers (and presumably other home cooks) baking their way through Peter Reinhart’s The Bread Baker’s Apprentice. This book, I have come to discover, is a bastion of bread baking tips, the ultimate home baker’s guide to bread. It’s been slow going because I can do, at most, two loaves a week, but I’m really enjoying it. I didn’t originally intend on sharing the recipes here because a lot of people are participating in this project and the last thing you need is my take on something that’s been said 1000 times. Unless it’s me reiterating for the 1000th time that I love pie. The reason I decided to post this particular cornbread recipe, however, is because it knocked my socks off. It was out of this world good- brown sugar and honey in the bread itself topped with delicious bacon. Thank you Mr. Reinhart, I will never make another cornbread. Until the next amazing recipe I find. God, I love cornbread. Anyway, this week for the zillionth time this year I’m sick and since the weather had been rainy, I indulged in a favorite comfort meal- chili and cornbread. I won’t lie and say it healed me (it’s not magic cornbread), but it did make me feel warm, happy, and totally loved. Bacon has that effect. 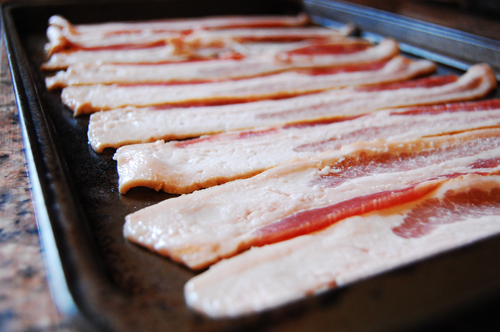 A side note about bacon, this recipe calls for rendered bacon fat. Which, is not a problem because I had to cook bacon for the recipe, but sometimes you want the essence of bacon without, you know, the bacon. Which is why I like to keep a few tablespoons of bacon fat in the freezer. I simply pour it, while it is still hot, into a glass measuring cup and then when it’s cooled a bit (but not solidified), I pour it into small glass jars and freeze. Then, I have it ready whenever I need it. Bacony advice from me, to you. I give the ounces here along with the normal measurements because that’s how Pete does it. Is it too familiar to call him Pete? The night before you want to make your cornbread, soak the cornmeal in the buttermilk, covered, and at room temperature. When you’re ready to make the cornbread, start by making your bacon. Bake at 375 for 15-20 minutes, or until crispy and golden brown. Drain the fat into a glass or metal container and let the bacon cool. When it’s cool, crumble and set aside. Lower the oven temp to 350. 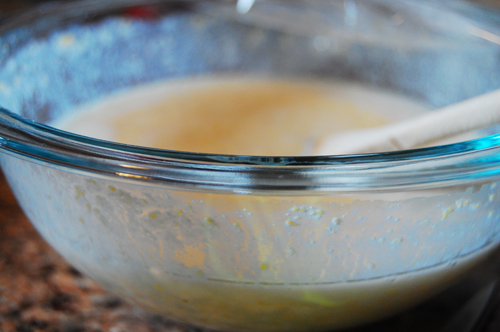 Mix together flour, salt, baking powder, and baking soda. Stir in sugar and brown sugar. In another bowl, beat eggs, lightly. 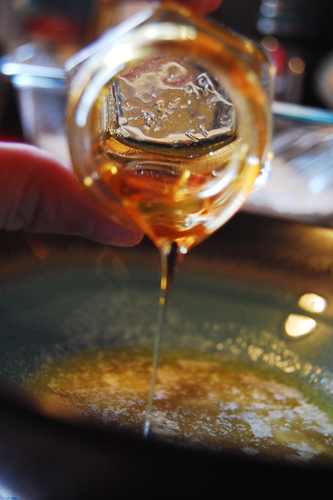 In yet another bowl, melt your butter and dissolve the honey in it. Stir the honey mixture into the eggs, and add that to the cornmeal mixture. Add the cornmeal mixture to the dry ingredients and stir with a large wooden spoon. Mix in corn kernels (make sure to drain them if you buy them frozen). 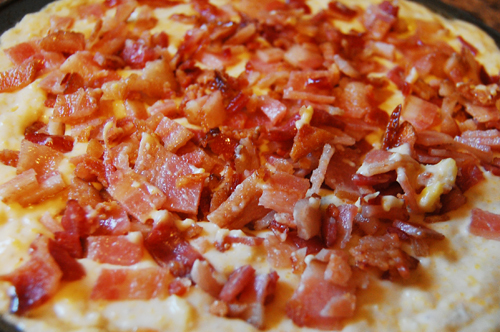 Pour the bacon fat into a 10″ round cake pan (or a 9 x 12″ baking pan) and stick it in the oven. Keep in the oven for 7-10 minutes or until it’s piping hot. With an oven mitt on, swirl the fat around and make sure all the sides are greased. Pour the batter into the hot pan. 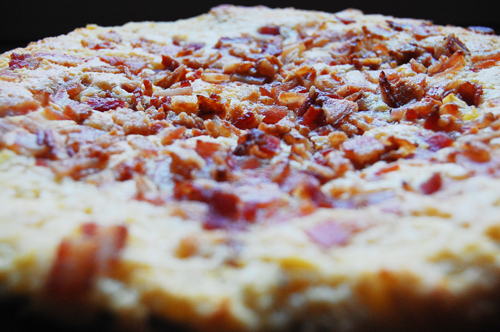 Sprinkle the bacon over the top evenly. Bake for 30-45 minutes until the center is solid and it’s golden brown. Let cool 15 minutes and serve. And enjoy! Yum I can’t wait to try this one. Thx! When I was growing up, my parents always had a dish of bacon fat in the fridge. For the first 10 years of my life almost everything was cooked in bacon fat and/or vegetable oil. 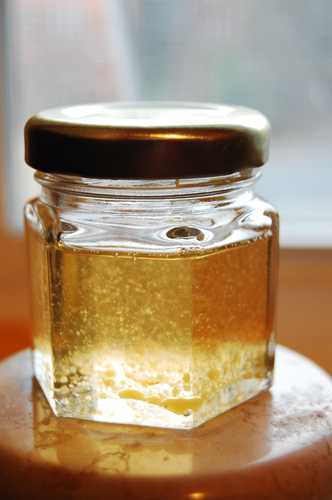 To this day I was have a jar of bacon fat in the fridge for frying up certain foods. I agree to some extent that you shouldn’t try and fix (enrich) what is already perfect, but I like to think that my grandparents would have liked this bread. Or at least tried it and pretended they did. I’m so glad I randomly found your blog. It rocks! Looks and sounds yummy! I have to give it a try.